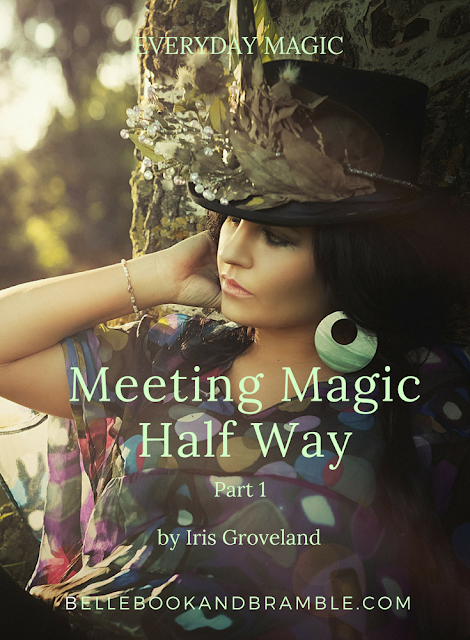 Just in time for spring cleaning, please welcome guest blogger Iris Groveland for Meeting Magic Half Way! I wanted to sit down to write about magic. Retreating into the study of my Victorian era townhouse, I sat down at my antique mahogany writing desk, the padded leather center worn with decades of astute study. I took the crystal sphere I kept on a pedestal, breathed in its cleansing essence, and grounded myself in the power I was about to conjure. The eastern facing window gave me a perfect view of the bird feeders and the young spring coming to life. The cedar-scented walls surrounded me as I conjured the energy that would go forth. Books lined the walls, tomes from all ages, and the brass fittings on the wall sconces glittered in the late morning light. I did the dishes. Then I made the bed. Then I got dressed; yesterday’s post-work lounge clothes, but clean socks and underwear. I spritzed on some orange body spray (it smells clean and fresh, giving the illusion that I am as well), combed my hair, and assigned a headband to do the day’s work of keeping my thin, fine, straggly hair out of the way. Ultimately, I did light some candles and a stick of incense, but the reality is, my crooked house is old and forever dirty. It sits out in farm country (where modern civilization is slowly creeping in via new development), on a stone foundation that probably dates to about the Civil War. The windows haven’t been cleaned in over three years, and the cat litter usually manages to spread itself over two whole rooms, despite daily sweeping. Keeping crumbs off the counter and making sure I’m not the only one cleaning the dog’s feet when he comes in is an hour-by-hour existence. Having dusted and vacuumed two days ago, this was about as clean as things get. But before I sat down to write about magic, I needed some semblance of order despite all of that, some degree of feeling organized and together, a sense of calm to help me organize my mind. Indeed, any time I want to sit down to a creative or leisurely endeavor, I am able to enjoy it and focus so much more in a clean(ish) space. 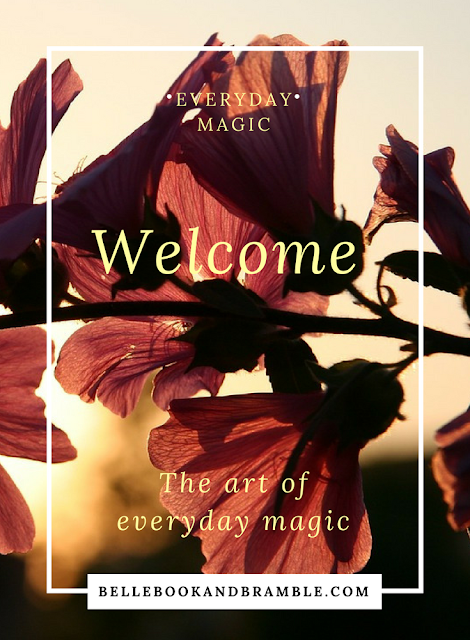 Having worked for a time in New Age retail, I dealt with customers on a daily basis who were looking for magical solutions to perceived esoteric problems. They were convinced they were cursed, that their homes or apartments were haunted, or that someone had unleased a demon into their space. (Always with the demons and portals!) They’d seen a few episodes of Supernatural or Charmed, read a blog on the internet (the significance of that is not lost on me here) and knew they needed to get some salt and some sage, but not much else. Or they came in with a recipe for a ritual pulled up on their smartphones and were ready to go shopping. One might say it was bad marketing to stop them in their tracks and ask them when the last time it was they cleaned their house, but that’s usually where we started. Aisle One: Housekeeping. When was the last time they let in some fresh air? Who were they keeping in their lives that contributed to this feeling of energy drain? What issues were they not confronting? I sold them their sage, their sea salt, and their herb candle and dream catcher, but it was always with a stern instruction to clean first. Clean first, then cleanse. There is just a frank part of me that feels no matter how much sage smoke you spread, your demons may still be there. You just won’t be able to see them for the clutter. For better or for worse, Hollywood has given us this perception that magic is always perfect and pretty and clean, and that results are flashy and instant. We see beautiful women working magic on the screen, wearing their beautiful clothes, with their perfect hair, and usually from the comforts of an old, romantic, beautiful house of mystery. Sandra Bullock’s kitchen is never full of messy pots and pans. Alyssa Milano’s bed is always made. Julia Ormond’s dining room table is never piled with homework, stuck-on food from yesterday’s dinner, crumbs, and still-packed grocery bags full of cat food and toilet paper. Sarah Michelle Gellar’s throw pillows and blankets are always just so. Their lives look perfect and clean at all times. Is it any wonder they vanquish demons and restore perfect order so easily? So as we open up the ways where we meet magic half-way, we need to start at the literal and figurative home base. Your most honest intent will not go unnoticed when you perform that cleansing ritual, but where did you start? At the end of an incense stick or the end of a vacuum cord? Plug in your intention as you go, but physical effort is called for. Your ceremonial garb will be your grubby clothes as we go forth, because fighting demons, like fighting dust, is dirty work. The obvious elbow grease of cleaning is always a good start. Wash and put away the dishes. Wash and put away the laundry. Half-measures can leave you open to feelings of imbalance when something is only half-done. Sweep, vacuum, and mop. Put a few drops of cedar, sage, or lemon oil in your mop water, whatever scent you feel called to use. It not only empowers the cleansing energy you are putting into the space, but the smell will help keep you on track by making you feel better. Clean your mirrors. Feng Shui dictates that mirrors help demons bounce off when they’re placed accordingly, but if you can’t move your mirrors, at least keep them clean. It will not only scare the demons away, it will give you a clean surface in which you take an honest look at your reflection. Scrub sinks and showers/tubs. Clean your shower curtain liner or replace it altogether. I have hard water, so even with a water softener, fighting build-up is part of regular maintenance. A clean shower or tub will go a long way for you when you perform a cleaning ritual for yourself when you’re done with the house. Wash curtains if you have them or dust blinds. Get under the furniture, in between couch cushions. Dust the books as well as the shelves. Get dirty. Get sweaty. Get your clothes grimy. Get spider webs in your hair and dirt under your nails. This is work, and unlike what Hollywood would make us believe, it is not a glamourous montage. Dorothy Morrison gave a workshop on cleaning and cleansing and she brought up two very good points which, I admit, had never occurred to me, but made perfect sense in hindsight, and I now consider these steps vital to cleaning and cleansing. Once you have busted your hump cleaning the space from top to bottom, and you light up your sage bundle or spritz your cleansing oil spray at every window and entrance, remember that, just like when you swept the floor and emptied your dustpan, the energy you’re banishing needs somewhere to go, too. Open some windows. Open doors. That energy you’re pushing out needs somewhere to go. Invite the Elements to eat it up. Water has helped you clean it; Earth is absorbing it and filtering it; the Fire from your candles or incense is slowly burning it like a trash heap, but that smoke needs somewhere to vent, so let some clean, fresh Air take it away for you. Secondly, once you’ve emptied that space of both physical and energetic dust, you’ve created a void that you now need to fill with what you want, or someone else will do it for you. You kicked the demons out, now who or what will take their place? Protection? Serenity? Love? Light that new candle now. Use that new oil you just bought. Like planting new trees after a fire, what grows now is up to you. In leveling personal power over your demons, taking ownership of your space on all levels, physical and spiritual, is perhaps the biggest step of all. In Part II, we’ll address a specific detail of this cleaning and cleansing work, the ever-mindful and constantly unfolding work of the purging of STUFF! When we talk about that which no longer serves us, we have to remember that our demons can sometimes lie hidden in boxes, in garages, in drawers, and yes, closets. This is soooo timely for me, Iris! My home is in desperate need of some serious decluttering. I swear, there are enough cat hair tumbleweeds around here to make an entirely new cat from! Now I'm more motivated to do my Spring Cleaning! Very good advise and new things to do and think about. Thank you!